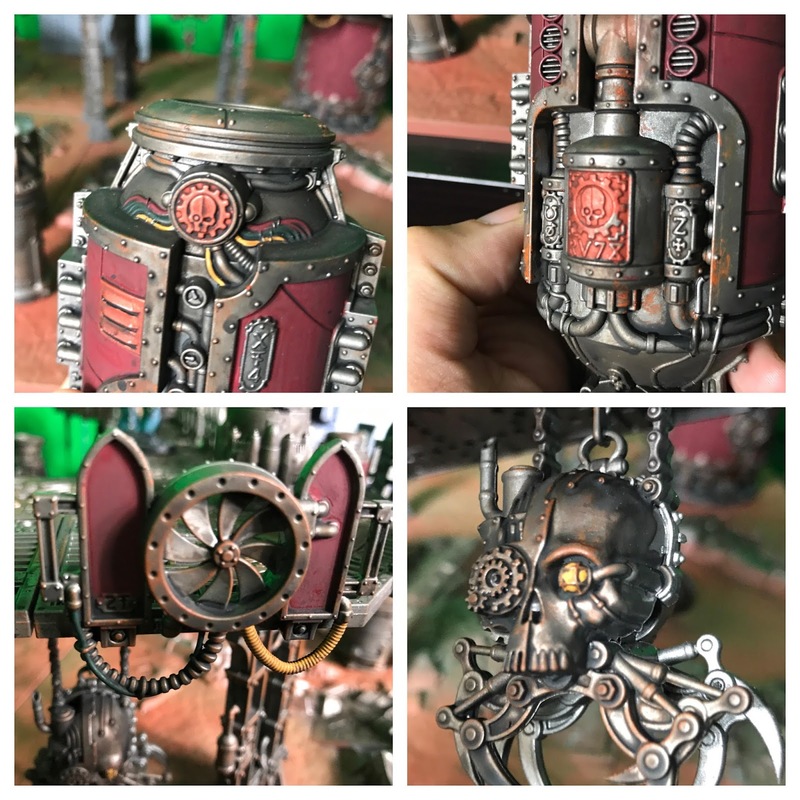 Last weekend saw me tackling the scenery pieces from the recently released Shadow War: Armageddon. The game is a modern version of Games Workshop's classic Necromunda game, except this time the game plays out with regular 40k factions. 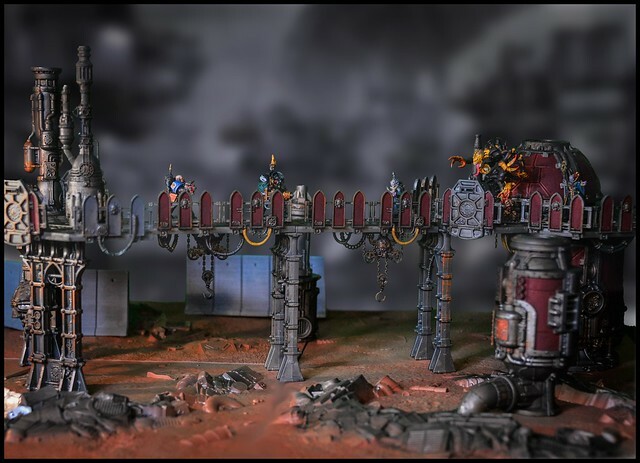 While I was a little sad that isn't going to be new sculpts of the classic urban gangs of the grim dark future the scenery kit that came with the new box more than made up for it! This is a nicely detailed and large modular kit. It's also exceptionally well balanced. 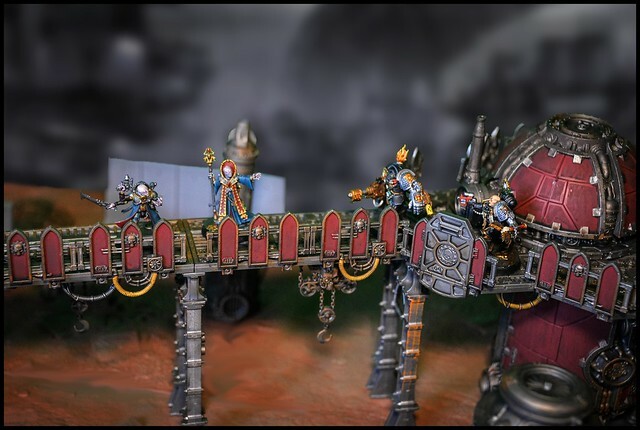 I had expected the platforms to be a little hard to place together on a regular gaming table given their height, but the models are stable even when sitting on their own. I wanted to go with a worn, weathered, and rusty look for the set, so I set about planning my approach with inks, washes, and some of the specialist paints from Games Workshop. So after assembly I went with a base of Leadbelcher using the spray can so we had a metallic base to work with. Then I start with the weathering. My approach is to first use Ryza Rust and apply that fairly heavily, roughly tracing out the edges of pipes, panels, or wherever there would be welds. Then I start to apply several layers of inks, using both Nuln Oil and Agrax Earthshade to build up the grime and weathering. Then I'll start to pick out a color for the paneling. I feel it's important that a kit like this has some identifiable core color to tie it all together and break up the metallic feel. In this case I went for a dull red, which I could also weather with a combination of Sepia and the Agrax. 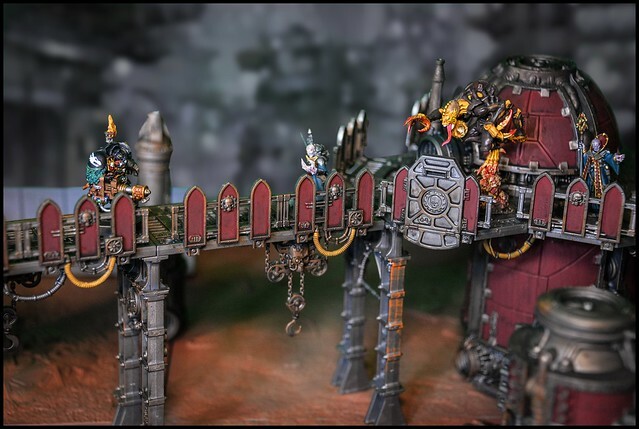 Then I'll take the other technical paint, Typhus Corrosion, and use that to blend the areas together. It also adds a great, grimy, appearance to the pieces, and helps make everything look that extra bit weathered. For some pieces I will then go around and edge highlight the panels with the original base color. It just helps highlight things and give them a little depth. I then went around and picked out some of the details where some added color helps provide some breakup. Coils, tubes, and plaques are good for that. I'll then use some inks to weather them, and help mute those colors and blend into the grime. Overall this was a wonderful kit to paint. I'm going to be looking forward to the games we'll get to play with this on the tabletop! Next up on the painting table will probably the new airships from the recently released Kharadon faction for Age of Sigmar. Steampunk Dwarves? I'm in!